Having witnessed people struggling to make healthy relationship choices, Julie Nelson, PhD, developed a desire to disseminate basic information about how to care for oneself while interacting with others. 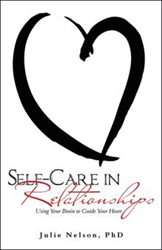 In the book titled “Self-Care in Relationships: Using Your Brain to Guide Your Heart” (published by Balboa Press), Nelson guides the readers through the basic skills required to connect with others in healthy ways. This easy and sensible approach comes from a compassionate and personal place as Nelson shares from her own experience as well as the genuine experiences of real people. Nelson believes that people are expected to possess adequate knowledge about self-care and effective communication and the formation of healthy relationships. However, people are not formally taught the skills necessary to create and sustain healthy mutually supportive relationships, and are not formally taught how to lay the important groundwork of self-care, which she believes, is a prerequisite. The book aims at providing some basic information that begins to fill those knowledge gaps and also facilitate more discussion and exploration about education in these important areas. Readers may visit https://www.balboapress.com/Bookstore/BookDetail.aspx?BookId=SKU-001135453 to learn more about this book. Julie Nelson, PhD is a licensed clinical psychologist with experience in secondary education. Her educational background, combined with her professional experience, offers a unique perspective on relationship literacy. She is certified in training and development and has developed and presented educational material related to effective communication, healthy relationships and self-care to a variety of groups and businesses. Fostering healthy, mutually supportive interaction is her passion. Nelson enjoys family, friends and creative textile arts. As an avid quilter, she finds ways to incorporate the healing properties and altruistic nature of small creative community groups into her work and rich presentations.